Vale's Artichoke Extra is a concentrated artichoke and turmeric supplement designed to help maintain healthy cholesterol and triglyceride levels naturally. Vale's Artichoke Extra is a concentrated artichoke and turmeric supplement designed to help maintain healthy cholesterol and triglyceride levels naturally. A poor diet high in saturated fats coupled with lack of exercise stresses the body and can result in poor health and disease. 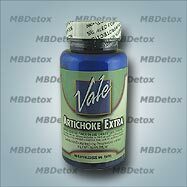 While you may be too busy to exercise regularly or completely change your diet, Vale's Artichoke Extra is an easy addition to your daily regimen that can help your body manage fatty foods and improve your sense of well-being. Take 1 capsule with each meal or 3 before bed.